A unique expression of modern Malaysian culture through form and graphics. Including News, Reviews, Photographs, illustrations, maps and community information on Sabah and Sarawak. 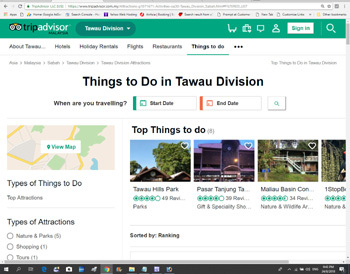 With main details on Tawau, Semporna, Kunak and Lahad Datu. 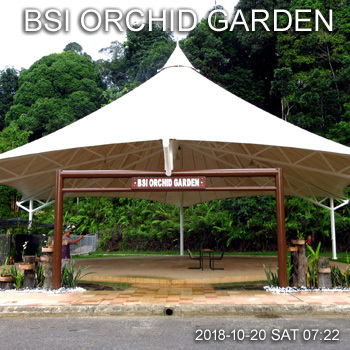 Spread over half acre of land at the left end of the BSI Eco Park, this is a beautiful new garden showcases some 50 orchid plants of Borneo Island. This is a private garden but public are welcome. When no visitor the gate is kept locked and need prearrangement with the office to open the gate. Please call office at Bandar Sri Indah 089-773311. 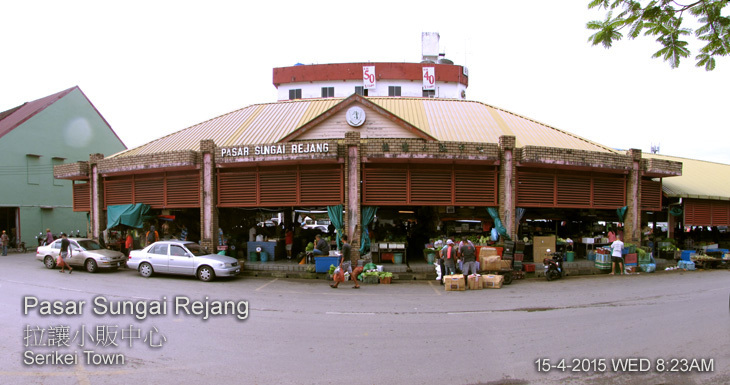 Equipped with 6,000 stalls, the Tawau Tanjung Market is the largest indoor market in the whole of Malaysia. The ground floor of the market are foodstuff such as fresh fruits, keropok amplang (amplang crackers), dried crackers imported from Indonesia and other fresh produce. On the first floor are dried preserved sea-food such as dried salted fish, dried anchovies and dried prawns which Tawau is famous for. 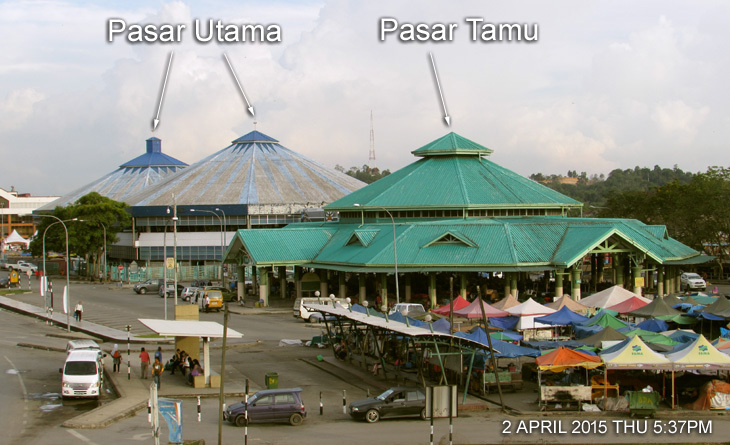 The cone-shaped roof Pasar Tamu and Pasar Utama located near to each other along the riverfront selling a range of local produces and local hawker food favourites. 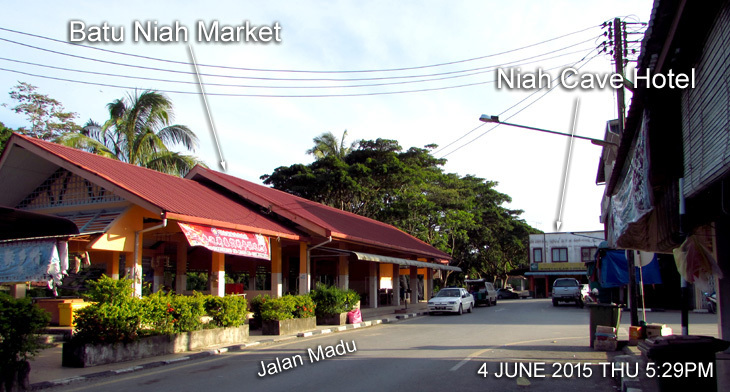 You can find the famous “Bintulu Belacan” or the shrimp paste here. Daily traders from longhouses selling veggies along a walkway behind a primary school near Pasar Teresang. As the site gets increasingly congested on weekends, some daily traders resort to hawking along the pedestrian walkway behind a primary school and the compound of a temple near the building. FRESH VEGETABLE MARKET of Kundasang is a belt of low single storey wooden shades by the highway. 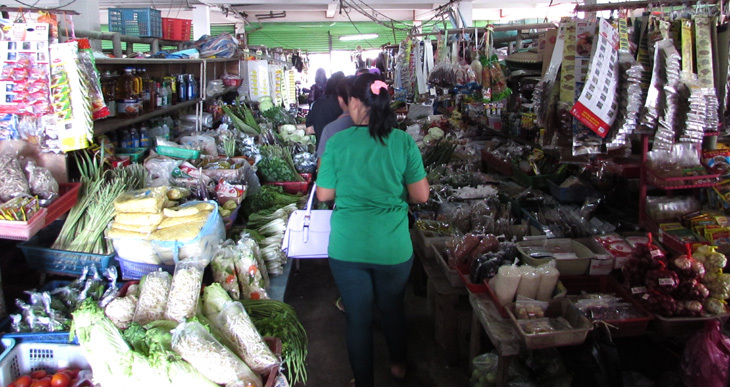 Various types of vegetables, fruits, flowers, and other products from the highlands were sold in Kundasang Market. Kundasang vegetable market is well-known for fresh and locally grown vegetables. 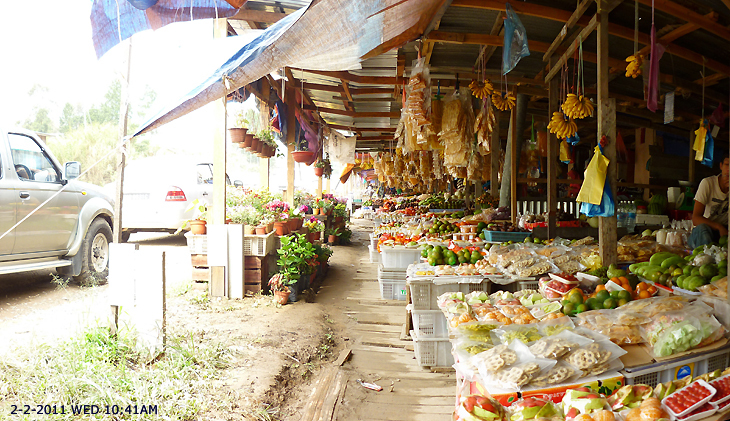 Local farmers sell their produce every day at this market located along the main highway. Fresh fruits, flowers and local produce such as wild honey are also sold here. I S M - Institute of Science & Management was began December 01 1990 as Sabah Chinese 'A' Level with 7 teaching staff and 40 students pursuing the Associated Examining Board GCE 'A' Level programme. Malaysia’s education system was gaining international attention with the country being recognized as having an effective conventional and religious curriculum by various groups. "University For All", the Open University Malaysia (OUM), launched on 26 August 2002, has "Lifelong Learning Programme" for senior citizens and the disabled. This programme, implemented in 2005, incorporated a special scheme for those aged 55 and above and the disabled, who need only pay half the tuition fees. The lifelong learning programme is an ongoing programme conducted on demand, varying according to the needs of the students or members from various organizations in Malaysia. After primary schooling, pupils will move on to secondary schooling. However, those from ethnic primary schools who wish to enter national schools will undergo a year in a remove class / remove form (kelas peralihan / tingkatan peralihan). Secondary schooling takes 5 years altogether. Labuan Airport opened in 1999 and serves the town of Labuan (Victoria) 2km away. The airport accommodate larger aircrafts such as the Boeing 777 and the Airbus A330. Each year the airport handle one million passengers and serves Malaysia Airlines and Air Asia. 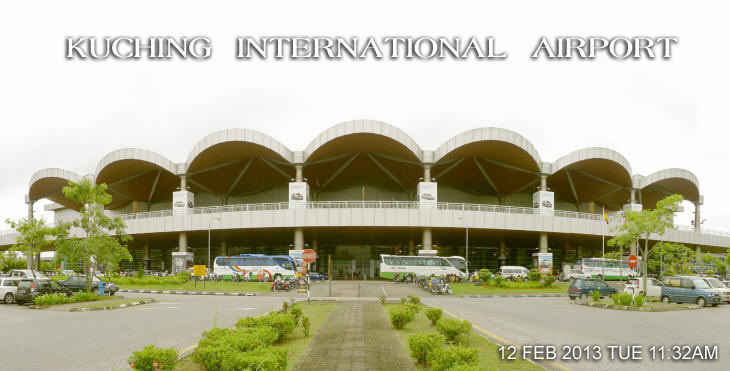 Kuching International Airport is located 11 km south of Kuching city center. The the third busiest airport in Malaysia in aircraft movements, serving over 1.5 million passengers per year. Miri Airport is a major hub for MASWings and AirAsia. 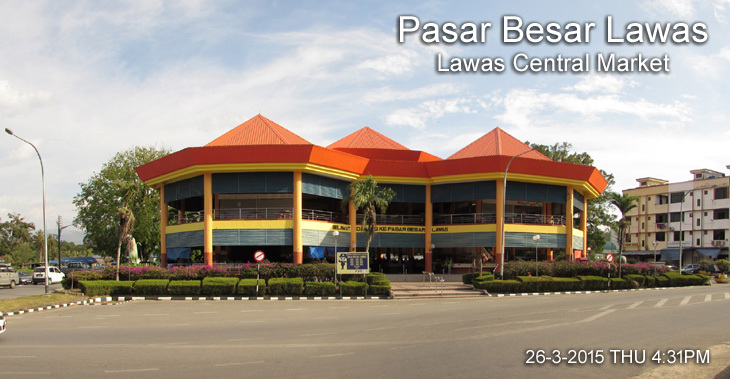 Lawas Airport is a Short Take-off and Landing (STOL) airport in State of Sarawak. This old airport is located near a river, and some land corrosion had been spotted along the riverbank. A new proposed airport is planed. Tawau Airport (Lapangan Terbang Tawau) is the second airport in Sabah with immigration counters for international flights. The airport is 31 km from Tawau town. The new runway could cater for aircraft as big as Airbus series. The airports handles only domestic flights from Kota Kinabalu, Sandakan and Kuala Lumpur. The previous international flights to Tarakan in East Kalimantan, Indonesia were suspended in 2008. Tawau Airport is under the management of Malaysia Airports Holdings Bhd. There is now airport in Semporna Town and Kunak Town. Passengers going to these two town arrive at Tawau Airport from here take land transport. 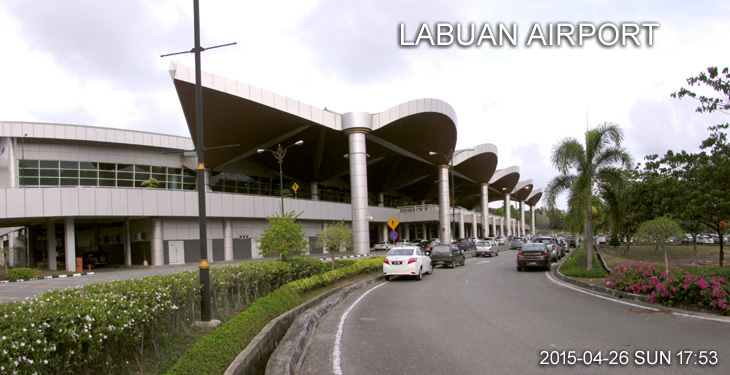 The nearest airport to Tawau Airport is Lahad Datu Airport which is two hours to drive. From Sibu one can take off from the main route of Pan Borneo Highway and travel by boat on the mighty Rejang River passes through Kanowit, Kapit to Belaga the heart of Sarawak .